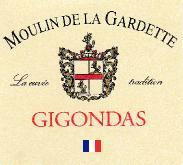 Moulin de la Gardette is a small 10ha family owned property in Gigondas with vineyards stretching from the plateau close to the village to the foothills of the Dentelles de Montmirail mountains. Most of vineyards face northwest, at elevations from 100m to 300m above sea level with soils that are a mixture of limestone and clay. 7ha are planted to Grenache and 3ha to other Southern Rhone varieties, Syrah, Mourvedre and Cinsault. The average age of the vines is 50years, but the oldest plantings now date back over a hundred years. The Grenache vines are mostly bush or 'goblet' trained, while some are staked for 'vertical shoot positioning' (VSP) training. Since 2000 we have employed organic viticulture with minimal use of copper and pesticides to enhance soil microbiological activity and express the best of our terroir.